Even if the RPF can deploy rapidly, it faces numerous interconnected challenges and political obstacles. Is the RPF’s Mandate Realistic? The RPF’s ability to “pacify” Juba hinges on its ability to act as an effective deterrent to rebel and government forces alike, but principally the latter. Successful deterrence requires a force that is militarily and politically credible and legitimate with local parties as well as international organizations. It is not clear that the RPF will be either. If deterrence fails and the RPF is required to engage in coercion or brute force, its 4,000 troops will be in no position to fight off the SPLA and could escalate the violence in Juba, thereby further endangering the almost 40,000 people currently sheltering at UN bases in the city. If events go smoothly, the RPF could help UNMISS provide better security at its protect of civilians sites, and could feasibly keep the airport and major transport routes open, although the government has rejected this role as potentially providing an open gateway for additional foreign forces to enter Juba. The RPF’s presence could also deter a possible rebel attack on Juba. Either way, protecting civilians and all humanitarian actors throughout Juba will be extremely difficult. Indeed, in the event of another direct conflict between the warring parties near or in the city, or if forces deliberately target particular civilians, the RPF’s protection mandate will prove impossible. In sum, the only hope of the RPF achieving its mandate will be if it has the active cooperation and support of both the government and rebels. Will the Government Cooperate with the RPF? By far the most important issue is the nature of the RPF’s relationship with Kiir’s government. Since UNMISS arrived in 2011, the South Sudanese authorities have challenged the mission in various ways, because it wasn’t what they asked for. The relationship only got worse after civil war erupted in December 2013, when the UN Security Council dropped UNMISS’s support for extending the state’s authority throughout the country and instead focused primarily on protecting “civilians under threat of physical violence, irrespective of the source of such violence.” However, the Security Council fudged the most glaring issue: that UNMISS required the consent of the very regime whose soldiers were the biggest perpetrators of violence against civilians. There is a fundamental difference between a mission designed to consolidate peace with the consent of most parties and UNMISS’s subsequent focus on protecting civilians amidst an ongoing war where the sides were often unclear and where numerous parties, including the government, regularly targeted civilians. Instead of radically transforming the mission to cope with such a daunting challenge, the Security Council offered a few thousand more troops as reinforcements. Despite the so-called P-3 powers (the United States, France, and the United Kingdom) regularly criticizing UNMISS troop-contributing countries (TCCs) for not using force to protect civilians, none of them sent their own troops. Consequently, the UNMISS reinforcements didn’t all arrive until July 2016. It was at this stage that Kiir’s government said it would consent to the RPF in principle but wanted to determine which states would contribute to the force. It is therefore more likely to cooperate with the RPF if it gets its preferred TCCs. However, the prospects for a smooth and cooperative relationship were dealt a severe blow with the passage of Security Council Resolution 2304 on August 12 2016. Divisions within IGAD and the AU permeated up to the UN Security Council with the result that resolution 2304 was passed with four abstentions (China, Russia, Egypt, and Venezuela), while the two other African states on the Council (Angola and Senegal) voted for the resolution. This was a political disaster, especially following on the back of Resolution 2303, which authorized the deployment of a UN police force for Burundi but also failed to secure the host government’s consent. Resolution 2304 caused serious consternation among some Council members because it appeared to depart from some of the basic principles of UN peacekeeping related to consent and potentially, impartiality. At the Security Council meeting, South Sudan’s representative reiterated his “Government’s rejection of the just adopted resolution 2304 (2016), as it does not take into account or even consider the points of view of South Sudan.” Egypt’s ambassador said the resolution amounted to a form of extortion against South Sudan, while the Chinese, Russian, and Venezuelan representatives reiterated the need for host government consent, without which they argued no regional force could succeed, and greater clarity about the modalities of the force. The resulting impasse prompted the Security Council to visit Juba in early September. Their stated aims were to clear the way for the RPF’s deployment, lift existing obstructions on humanitarian actors and the movement of peacekeepers, and make progress towards a political agreement. While the Security Council delegation returned to New York announcing a successful visit, one South Sudanese Cabinet Minister saw things differently, declaring that his government had “won the game” with the Security Council. While Council messages focused on securing the government’s consent, the government’s focused on ensuring further negotiations on “modalities” before the RPF could deploy. That many local civilians seeking protection in Juba clearly want the RPF to deploy does not change the fact that the government remains reluctant to allow the RPF to in any way threaten its “sovereignty” and seeks to put conditions on its operations (including what arms it can bring). And this is a government with a significant track record of obstructing UNMISS activities and even repeatedly attacking (and killing) UN personnel and shooting down two UNMISS helicopters. The prospects for cooperation are therefore likely to hinge on which countries make up the RPF. Who Will Make up the RPF? So far, Ethiopia, Kenya and Rwanda have been discussed as potential TCCs for the protection force. Each faces challenges. Ethiopia has a tense and highly militarized border with neighboring Eritrea; it is already the world’s leading peacekeeping contributor with over 8,300 deployed in UN missions and well over 4,400 troops deployed in Somalia. It is home to a significant Nuer population and Ethiopia’s army also recently deployed into South Sudan to try and return children who had been kidnapped by the Murle militia in a violent cross-border raid into Ethiopia’s Gambela region. Kenyan forces are also stretched with operations in Somalia and in their own northeastern region against al-Shabaab. Rwanda, for its part, already has over 6,100 troops and police deployed as UN peacekeepers. Perhaps more fundamentally, however, all three countries are already major contributors to UNMISS and have suffered from the same limitations related to civilian protection and dealing with belligerent SPLA soldiers as everyone else. As of August 31 2016, these three countries provide 4,477 uniformed personnel or 32.6% of the UNMISS force: Ethiopia with 1,267 troops, 10 experts, 21 police; Kenya with 1,027 troops, 12 experts, 14 police; and Rwanda with 1,843 troops, 13 experts, and 270 police. This raises the question of whether any additional contingents from these countries would be prepared to fight the SPLA if necessary. Finally, it is far from clear that neighboring states would make the best peacekeepers. Most of the AU’s recently authorized operations have primarily involved peacekeepers deploying from the local neighborhood, in large part because they tend to display the greatest willingness to use force if their interests are at stake. However, neighboring countries tend not to be impartial because of their political, economic, and social entanglements in the conflict. As a result, they are often viewed with suspicion by elements of the local population and struggle to maintain legitimacy. It is probably for these reasons that President Kiir’s government has been critical of the idea of neighboring states deploying in the RPF, which would leave only Rwanda. How Should the RPF Relate to the Rest of UNMISS? The RPF has been authorized to form part of UNMISS. It therefore resembles the arrangement used in the Democratic Republic of the Congo when in 2013 the Force Intervention Brigade comprised of troops from Malawi, South Africa, and Tanzania was deployed as part of the UN mission, MONUSCO, to conduct offensive operations against the M-23 rebels. However, the lessons from this case highlight some of the risks the RPF will face in South Sudan. First, the Intervention Brigade worked well because it coordinated closely with the government forces in eastern Congo. The RPF in South Sudan is not similarly tasked. Second, the Intervention Brigade’s experience demonstrates that political consensus and commitment among the TCCs is more important than military muscle. Hence, while the TCCs were united in their desire to defeat the M-23 rebels, the Intervention Brigade worked effectively. When faced with other targets, however, that political unity eroded and it proved much less effective at tackling other armed groups, including the Democratic Forces for the Liberation of Rwanda and Allied Democratic Forces. The TCCs to the South Sudan protection force must therefore remain not only integrated militarily but also united politically in pursuit of the mandate. US Special Envoy to South Sudan, Donald Booth, recently announced that the governments of Ethiopia, Kenya, and Rwanda had assured him that they are willing and able to perform those tasks. The Intervention Brigade in MONUSCO had the unintended negative consequence of creating a two-tier mission. Specifically, its arrival led most of the so-called framework brigades in MONUSCO to stop conducting proactive and forceful operations to protect civilians, despite that being their principal mandated task. There is a risk that the same dynamic could occur within UNMISS once the RPF is deployed, especially for those UNMISS contingents based in Juba. Should the RPF Be Part of UNMISS? In sum, if the RPF’s mandate is broadly similar to the existing UNMISS mandate, then there seems little point to deploying the RPF as a distinct entity rather than simply increasing the number of troops in UNMISS. However, if the RPF’s mandate is significantly different to the existing UNMISS force, then it makes less sense to integrate it into UNMISS because of the risk of creating a two-tier mission, and one in which there is potential for the RPF, if it engages forces from either side, from becoming a party to the conflict. Deploying the RPF and enhancing UNMISS is not the same thing as having a viable strategy for resolving the ongoing war in South Sudan. Peacekeeping and peace enforcement operations are limited political tools that can only succeed if they are part of a political strategy to end the war. The governing authorities in South Sudan have repeatedly shown themselves both unwilling and unable to protect civilians and provide the basic services expected of a functioning government. 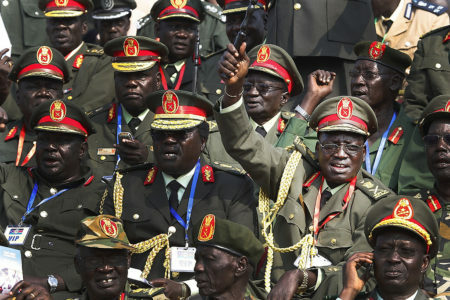 Probably since Operation Lifeline Sudan started in 1989, the South Sudanese elite has been able to ignore the plight of its own people and rely consistently on international actors to provide them with the requisite aid and assistance. It should also by now be clear that Kiir’s government (and perhaps the rebels) is unwilling to share power. And yet there has been deep international reluctance to press for sanctions on either party’s leaders, no arms embargo, no progress in establishing accountability, and hence no major consequences for the South Sudanese elites who have continually flouted IGAD, AU, and UN resolutions. Consequently, the most sensible approach would be to establish some form of transitional administration for South Sudan. However, this option remains politically unpalatable in Juba, Addis Ababa, and New York. It is into this political maelstrom that the RPF will deploy. It will represent the latest attempt to provide a military band-aid to a gaping political wound.